College visits are a great way to get a sense for what a school is like. Information sessions, campus visits, sitting in on classes, and just wandering around the grounds provide an opportunity for prospective students (you!) to truly experience the school. As I visited East Coast schools this fall, I gained a better understanding of the colleges on my list and caught a glimpse of what life would be like as a student there. In fact, I took three schools off my list after visiting because they fit me on paper but not in person. As you plan and attend campus visits, try to question, observe, and reflect to get the most out of the experience. First things first: questions, questions, questions. Questions will prove to be perhaps the most important part of your college visit. I highly recommend going into the experience with a specific set of inquiries that will allow you to see if the school is aligned with you—even your little, nitpicky needs and wants. However, definitely don’t ask questions you can find answers to online via the school’s website, online forums, or college search websites. For example, don’t ask how many undergrad students there are or what the average ACT score of admitted freshmen is. You can find that out online (bless the Internet). Instead, sit down with your parents and brainstorm a list of things you want to know. For a great list of questions to ask yourself and others on your visit, check out this article. Are there poetry, outdoor, and politically inclusive clubs? What are the vegan options on campus? How popular are the college’s sports on campus? How prevalent are fraternities and sororities on campus? What are the students like in general? Is the school is generally collaborative rather than competitive? However, though I compiled a list of questions, I didn’t necessarily ask them out loud. A lot of my questions were answered by attending the information sessions, listening to answers given to other prospective students’ questions, and exploring campus. I made sure to pay attention and take notes on what was said, so I could compare schools as I reflected on my experiences. Taking notes is most certainly a must-have for college visits. In one information session, I recorded information regarding admission on my cell phone, so I’d know exactly what was said. As I wrote my supplemental essays for that university, I listened to the memos to remind myself what I’d learned in the information session. 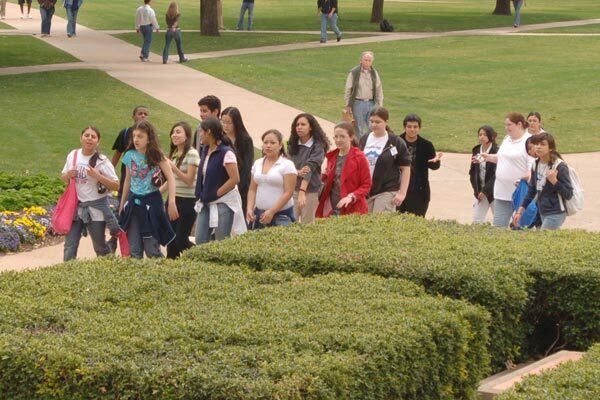 The campus tour, usually led by a student, is another essential part of your visit experience. All the tour guides I’ve encountered have been friendly and willing to answer my questions in a more casual environment than the information session. If your tour guide doesn’t delve into why he or she decided to attend the school in question, ask! Try to talk to other students as you make your way around campus too. Often, tour guides will introduce you to students they know as you go through the tour, but if you’re not with a tour guide, try asking a student for directions (and sneak in a couple questions about their experience at the school while you’re at it!). Speaking to students in person provides insight the Internet generally can’t. Feel free to ask your tour guide about all the ins and outs of the school, and spend time in student hubs like the dining hall to get a sense for the overall vibe of the student body, plus you can get a (literal) taste of the college for yourself. Consider sitting in on a class as well; it can be a great way to observe how the faculty and students interact, and you’ll see how the students conduct themselves in class (super engaged vs. bored, etc.). Check on the school’s website for information, contact a faculty member, or ask an undergraduate admission counselor. Don’t forget to see if there’s a sample dorm you’re allowed to see, and always ask if you can check out the library. Of course, it’s possible to scope out many elements of a school online if you don’t have time or resources to visit. However, if you do, I’d recommend visiting. My visits really helped me solidify my college list, and even prompted my choice to apply Early Decision to a school. Remember, as you embark on your college visits, question, observe, and reflect to get the most out of your experience on campus!